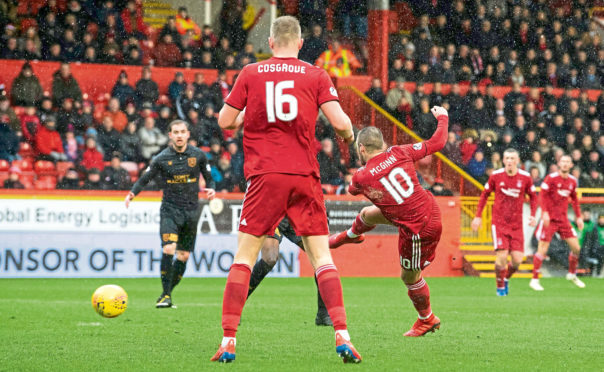 An excellent week for Aberdeen ended on a disappointing note as their poor run of form at Pittodrie continued against Livingston. After following up a deserved draw at Celtic with Tuesday’s fine 2-0 Scottish Cup win against Rangers at Ibrox, it felt like this was the perfect time for the Dons to record a first league win on their own patch since before Christmas. Instead, Livingston took a share of the spoils in front of a disgruntled Dons support. McInnes’ side went into the international break with one win in nine games at Pittodrie, a run they must address to stand any chance of catching second-placed Rangers. Sam Cosgrove returned to partner Stevie May in attack after missing the Scottish Cup quarter-final replay against Rangers through suspension. Neither side wasted time with measured build-up play; miserable conditions dictated back-to-front football. Cosgrove was the obvious target for the home side and with Niall McGinn and Connor McLennan, there was adequate delivery from the flanks. The drive came from McLennan down the right, who had the beating of Ciaran Brown but a scarcity of red shirts to aim for. Aberdeen primarily looked to their centre-backs to instigate attacking moves, with Scott McKenna and Mikey Devlin regularly pinging diagonal balls towards the channels. One such occasion released McLennan and his foot went to the accelerator, dropping Brown in his stud-marks and whipping in a delightful near-post cross. He got a second bite when it was diverted back to him, with a pin-point centre to McGinn, who dispatched his volley with aplomb beyond the goalkeeper’s dive. This game always had the danger of being “after the Lord Mayor’s Show” for the Dons. The focus over the previous seven days had been getting results in Glasgow and, at great exertion, they had done that. Taking on a gritty, disciplined Livingston in horrid conditions was a recipe for a back-down-to-earth party. Craig Sibbald’s leveller two minutes before the break would have jolted many from their frozen slumbers. Craig Halkett was allowed to cross from the right without a red shirt contesting the ball, with Sibbald crashing in with glee from barely two yards. Declan Gallagher thought he had Livi in front soon after the restart from a Keaghan Jacobs free-kick. While Aberdeen were bailed out by the offside flag, the visitors showed no signs of going away. Dean Campbell was brought on for May in the second half to bring an element of control to the midfield. The Dons had seen little out of Graeme Shinnie and Lewis Ferguson in the middle of the park and, returning to the system that worked against the Old Firm, they tried to pry open the Livi door. Teenager Campbell at times operated like a lone central midfielder, with everyone in front of him pushing Livi further and further back. But as their defensive line deepened so did their resolve, with a frustrated Aberdeen running short on ideas and running out of time.